Increasing prevalence of blood-related disorders and rising demand for blood collection and transfer bags are expected to drive growth of the global disposable plastic blood bags market during the forecast period (2016–2024). Additionally, increasing demand for blood-derived products and surge in transfusion procedures are expected to fuel demand for disposable plastic blood bags during the forecast period. Factors such as increasing incidence of trauma/accidental injuries and tender-based purchases by governments of developing countries coupled with customized blood bags with tracking systems offered by blood bags manufacturers and easy availability of value-added products for blood collection are expected to boost growth of the global disposable plastic blood bags market. However, factors such as lack of infrastructure facilities for blood collection & storage and low awareness about voluntary blood donation initiatives are expected to hamper growth of the global disposable plastic blood bags market over the forecast period. Government encouragement for increasing usage of biocompatible PVC blood bags and low prices of plastic blood bags owing to tender-based purchases are factors expected to fuel demand for blood bags during the forecast period. The global disposable plastic blood bags market is estimated to be valued at US$ 198.1 Mn by 2016 end and is expected to reach US$ 409.2 Mn by 2024 end. Global consumption of disposable plastic blood bags is expected to exceed 320 Mn units by 2024 end, increasing at a CAGR of 11.9% over the forecast period. On the basis of product type, the global disposable plastic blood bags market is segmented into collection bags (further sub-segmented into single collection, double collection, triple collection, and quadruple collection) and transfer bags. In terms of value, collection bags product type segment is estimated to account for over ~71% market share of the global market by 2016 end. On the basis of sales channel, the global disposable plastic blood bags market is segmented into tender sales and private sales. In 2015, tender sales segment was valued at US$ 112.9 Mn. In terms of volume, tender sales channel segment is expected to expand at a CAGR of 9.9% over the forecast period. This is attributed to tender sales being the most preferred way of blood bags procurements by healthcare settings worldwide. On the basis of end user, the global disposable plastic blood bags market is segmented into hospitals, blood banks, and NGOs. In 2015, blood banks end user segment was pegged at 91 Mn units of disposable plastic blood bags. In terms of value. Hospitals end user segment is expected to account for ~5% share of the global disposable plastic blood bags market, owing to increasing privatization of healthcare services in countries such as India and China. 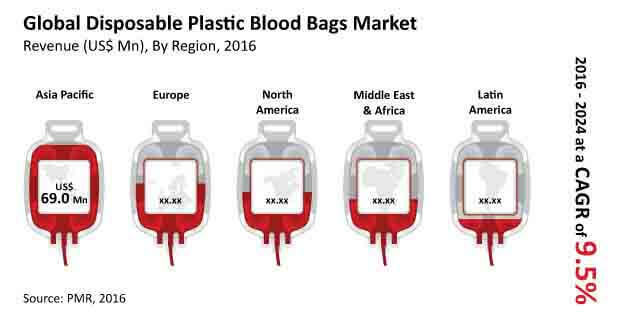 The global disposable plastic blood bags market has been segmented into five major regions, namely North America, Latin America, Europe, Asia Pacific, and the Middle East & Africa. In terms of value, APAC is estimated to dominate the global disposable plastic blood bags market, with over 34.8% share of the global market in the year 2016. The markets in North America and Europe are expected to register significant growth over the forecast period, owing to increasing demand for blood and blood components. Some of the key players identified in the global disposable plastic blood bags market report are Fresenius SE & Co. KGaA, Terumo Corporation, Grifols, S.A., MacoPharma, S.A., HLL Lifecare Limited, Poly Medicure Limited, INNVOL Medical India Limited, and Span Healthcare Private Limited. The report also includes identification of company-specific strategies related to manufacturing and marketing activities, and analyses of the various market players’ specific strengths, weaknesses, opportunities, and threats.